Auction Listings in North Carolina - Online Auction Auctions - Coppersmith Antiques & Auction Co. THIS WILL BE A TIMED ONLINE ONLY AUCTION EVENT. One lot will be scheduled to end every 30 seconds.THERE ARE TONS OF HIGH QUALITY PHOTOS OF THE ITEMS BEING SOLD ON OUR WEBSITE. IF YOU NEED TO SEE A LARGER IMAGE PLEASE VIEW WWW.COPPERSMITHANTIQUES.COMTERMS OF SALEWe advise all prospective bidders to read the Terms & Conditions of the Auction Sale before bidding in a Coppersmith Antiques & Auction Co. auction. By placing a bid the bidder is bound by those Terms and Conditions of the Sale, as amended by any oral announcement or posted notices, which together form the contract of the sale between the successful bidder (purchaser), Coppersmith Antiques & Auction Co. and the seller (consignor) of the lot(s).1. All property is sold "As Is, Where Is", and All Sales are Final. There is no bid reversals or refunds.2. INSPECTION: Property is open to thorough public inspection. The bidder is invited, urged and cautioned to inspect the property prior to bidding. Property will be available for inspection at the places and times specified. It is the Bidder's responsibility to determine condition, age genuineness, authenticity, value or any other determinative factor prior to placing a bid on an item. Bidder shall be the sole judge of value. Coppersmith Antiques & Auction Co. may attempt to describe the merchandise in advertising, on the internet, over the phone and at the auction but makes no representations. Persons in attendance during inspection, sale or removal of merchandise assume all risks of damage or loss to persons, property, or merchandise and shall exercise proper precautions at all times for the protection of persons and property and shall comply with all safety and health requirements as directed by Auctioneer, and local, state and federal regulations. Auctioneer, its agents, its employees and representatives shall not be liable by reason of any defect in or about the condition of the premises on which the auction is held. Buyer specifically releases Auctioneer, its agents and representatives from all liability thereof. In no event shall Coppersmith Antiques & Auction Co. be held responsible for having made or implied any warranty of merchantability or fitness for a particular purpose. 3. BIDDER REGISTRATION: Bidder must be 18 years of age or older, and is required to register for each auction. To participate in this Auction prospective bidders must register & provide identification information to establish that you are a valid bidder: At the time of registration, we collect information about you to verify who you are before you can bid. Bidder must submit information found to be current, complete, and accurate for proper identification. We collect credit card information to ensure that you are a qualified buyer. Bidder is responsible for security of his/her bidding number/user name and password, and any and all bids placed under the assigned number/ID. Auctioneer should be notified immediately if Bidder believes his/her bid number, account and/or password have been compromised.There is no cost to register for an auction (A $1 Authorization will be charged when you initially register to validate your credit card by Auctionflex.) The Authorization is never deducted from your account. It verifies that the card being placed on file is legitimate. The Billing information including address will be validated through this authorization. If the Billing information on the Card doesn't match your shipping information the card may be rejected for possible fraud activity. Coppersmith Antiques & Auction Co, at its sole discretion, reserves the right to terminate any registration, deny any person for any reason permission or access to bid, to reject any and all bids, and to suspend or ban Bidder from bidding. Bidder registration is not transferable or assignable. Highbid User Ratings. Every bidder starts with a reputation of 0 and, with activity, this score goes up or down to a value between -100 (very bad) and 100 (very good). Any bidder with a reputation lower than +1 will have their auction bid permission set to pending. We will verify your information if you are a new bidder with a reputation of "0". Once approved or declined you will receive an email confirmation. If you have a negative user rating/score on Hibid or Proxibid Coppersmith Antiques & Auction Co. at its sole discretion may decline any and all bids placed by your account. As a last resort if we find you to be a non paying bidder or using fraudulent registration and/or credit card information you may be permanently declined from bidding at our auctions.If you are not comfortable or willing to register online which includes placing a credit card on file on our Secure Web server you may enter bids in person at our facility. Bids must be in writing and are legally binding just the same. A Valid Credit Card will still be required on the bid form. Valid Identification will also be required if you are unknown to Coppersmith Antiques & Auction Co. We will upload the bids placed by you on your behalf onto the online bidding server.4. All items offered online will have a minimum starting bid as displayed on the online catalogue. Online bids lower than minimum will not be accepted.5. CATALOGUE ERRORS & OMISSIONS: If a description does not match a picture in a lot, the description takes precedence. If you find an error please contact Coppersmith Antiques & Auction Co. and we will attempt to rectify it. All items are sold on an "as is, where is" basis, with all faults. In the event an item was listed in error or an item can't be located during pick up for any reason, the bidder agrees that their maximum recourse is a full refund of the item in question and that all other items bid on remain binding. By bidding you are acknowledging agreement with the terms above. Do not bid unless you agree to all of these terms. The Bidder is responsible for knowing which item is being bid on. If the Bidder is unsure, they should inquire or not bid. When becoming the winning bidder at auction you have effected a contract and will be expected to pay for items in which you were evidenced to be the successful bidder. Auctioneer will not honor "mistakes".6. REVIEWING YOUR BIDS: During an auction you can check the status of your bids at anytime by logging into online server. Please be careful when placing bids. Placing a bid is a two step process. When you click bid button it will pull up a window verifying that you want to place that bid. If you want to place the next bid increment that the computer is asking for you can do that. If you desire to increase the amount of your bid this screen will allow you to bid a higher amount. Ensure that you type in the correct amount. If you make an error Coppersmith Antiques & Auction Co. can attempt to correct it but it has to be in a timely manner before the item closes. In order to make a correction you must contact the Coppersmith Antiques & Auction Co. at 252-331-5814. We have a staff member in the office during all online auctions. You are responsible for the bids that you place. Note that no bids can be withdrawn after the auction for any reason.7. PROGRESSION OF THE AUCTION: Each Auction will have a scheduled time that each auctions items will begin closing. If an auction starts closing on a Thursday night at 8PM the first lot will be scheduled to close at that time. Depending on the quantity of items in the Auction lots may be scheduled to end anywhere between 30 to 60 seconds a part. Each lot will show a scheduled ending time. If no one bids in the final minute before a lot is scheduled to close that lot will close out. If someone bids within the final minute before that lot is scheduled to close, 3 Extra minutes will be added to that lot and that lot only to allow additional time for people to bid. The remaining lots behind that lot will continue to close as scheduled unless someone bids in the last minute on that specific lot as well. This is done to prevent a bidder from 'sniping', all bids made in the last minute of the auction will force an item to stay open for an additional 3 minutes. This gives the back up bidder additional time to increase his/her bid if desired. This process will continue until all bidding has ceased and no one bids within the additional 3 minutes that were added. 8. PAYING FOR YOUR PURCHASES: There is no cost to register for an auction. Generally you will receive an "UNPAID" Auction Invoice on the day/night of the Auction immediately following the sale. We generally process Credit Card transactions the day after the Auction at a specified time. If you don't contact us during this period we will Charge the Credit Card that was placed on file at Registration for the Purchase price of your won items including Sales Tax and Buyers Premium. In addition if we move your items from the Auction site back to our facility you will be responsible for a transportation fee as stated in terms of auction. If your Credit Card is declined you can pay cash in person when you pick the items up.9. BIDDING NOTIFICATIONS: You can choose to be notified by e-mail during the auction if you have been outbid. Please note that outbid notifications are NOT sent out during the last two hours of the sale. You can watch each item end. If you are the high bidder on an item the item will be highlighted in Green in the Live Auction area. If the lot changes from green to red it means that you have been outbid and would need to bid again At a higher bid. The item will not change back to green until you have surpassed the high bid that the back bidder placed.10. RESERVE: Seldom are items sold with Reserve. If an item is being sold with a reserve, it will be clearly marked and identified. For items sold with a 'reserve', you will be required to pay a minimum amount in order to win the item.11. REMOVAL OF ITEMS: All items are sold in place. Buyers are responsible to remove items in a good workmanlike manner. Any plumbing must be shut off before being disconnected and any electrical that is disconnected must be capped. You must bring any and all tools, equipment required to disconnect and remove any items you purchase. You must bring any required labor to assist in carrying your items from the home to your vehicle. We will have staff onsite to assist buyers in finding their items but they will likely not be available to assist in any way with removal of your items. Please plan ahead and come prepared. You are expected to bring boxes, packing materials, tape, tools, wheel carts, dollies or anything else needed to remove your items in a timely manner. Any items not removed by the times shown will be deemed abandoned regardless of the price. If you can't pick your items up during the time scheduled, you are responsible for designating someone to pick your items up during the time that we are scheduled to be there. Many of these auctions are conducted offsite in a consignor's home. We have contracted with that person the dates that we are provided access to the home. You have been advised of the preview and pickup dates prior to the auction. If you are unable or unwilling to pickup your items during the scheduled time please don't bid on the items unless you provide someone to pick your items up for you.12. RISK TO PERSON AND PROPERTY: BY REGISTERING AS A BUYER, YOU AGREE THAT Coppersmith Antiques & Auction Co. & THE SELLER/CONSIGNOR ARE NOT LIABLE TO YOU FOR ANY DAMAGE TO THE ITEMS YOU PURCHASED, YOUR OTHER PERSONAL PROPERTY, OR FOR INJURY OR DEATH. Please take care of yourself and your items as you have released us from liability. We will not be liable for damage or injury to individuals or their property. Purchaser assumes all risk and liability whatsoever resulting from the use of the item(s) sold hereunder; and shall defend, indemnify, and save harmless Auctioneer and Seller from any liability.13. AUCTION RECORDS: In the unlikely event of a dispute, you agree to accept as true the information that we have in our records. 14. ADDITIONS & DELETIONS: We reserve the right to remove and/or add lots and/or items to the sale at any point during the auction. 15. The Auctioneer reserves the right to accept bids in any increment he feels is in the best interest of his client, the Seller. The Auctioneer reserves the right to reject the bidding of any person whose conduct, actions, or adverse comments he feels are not in the best interest of the Seller.16. Titles will be disbursed on auction day only if payment is made in cash.17. SALES TAX: Sales tax will be added to the purchase of all taxable items. Some bidders may be exempt from payment of applicable taxes. If you wish to apply for tax-exempt status, you must submit a completed copy of the Auctioneer's tax exempt form prior to this auction's closing. Please note that the Auctioneer requires bidders to submit a new tax-exempt form for every sale. Once you have completed your tax-exempt form, please ensure it includes your bidder number and the date of the auction, and email the form to coppersmithauction@embarqmail.com prior to the sale's closing so that we can review your information. If you do not follow the procedures discussed in this paragraph, the Auctioneer will be unable to consider identifying you as exempt from taxation, and you will have to apply directly to the applicable state for a refund. Please also note that, depending on the state whose sales tax applies, submission of the Auctioneer's tax exempt form may not be sufficient to entitle you to tax-exempt status. Please review the form and its contents carefully, and contact the Auctioneer with any questions you may have. You can't use someone else's Sales & Use License.18. If the foregoing conditions or any other applicable conditions are not complied with, in addition to other remedies available to Auctioneer and Seller by law, including without limitation, the right to hold the purchaser liable for the bid price, the Auctioneer, at their option may (1) resell the property publicly or privately, with purchaser being liable for the payment of any deficiency plus all costs incurred, or (2) cancel the sale, retaining liquidated damages on all payments made by purchaser, Auctioneer commission and all other incidental damages will be charged.19. Information in brochures, catalogs and other advertisements are from sources believed to be reliable; however prospective purchasers are urged to inspect the inventory or property to satisfy themselves as to condition, model, manufacturer, year, features, mileage, survey, acres, etc. Neither the Auctioneer or our client make any guarantees and are not responsible for listing or advertising inaccuracies or discrepancies.20. All statements made by the Auctioneer the day of the auction take precedence over oral statements and/or printed materials.21. Local Pickup is recommended. Prompt pickup is required. Buyer responsible for bringing all Tools, Manpower, Boxes & Packing materials to remove the items in a timely manner. 22.SHIPPING - Any purchases made that need to be shipped will be at the sole expense of the purchaser and will be added to the hammer price. Shipping of small items will be handled by a local shipping company at an additional cost to the buyer. Any item that cannot be sent through USPS or similar carrier must be sent by common carrier or specialty delivery services. You may contact shippers for quotes on larger items. 23. Coppersmith Antiques & Auction Co. reserves the right to extend the bidding time if an error should occur with the online server.24. By registering for the Auction you hereby agree to receive mail and/or email correspondence from Coppersmith Antiques & Auction Co. from time to time. 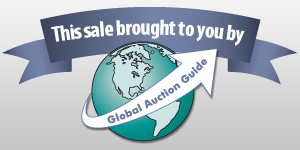 Auctioneer uses email mailing lists to notify customers about online and live auctions. Customers who do not wish to be notified should contact the office of the Auctioneer and request removal from the email mailing list. You can unsubscribe at any time.25.BUYER'S PREMIUM: A premium of 10% of the bid price will be added to the price of each item purchased. Taxes are calculated AFTER the buyer's premium. The Bidders Payment Type will not affect the Buyer Premium at an Online Only Auction. The buyer's premium includes commissions and/or fee's retained by the Online Bidding Platform company. Announcement:Information contained herein is presented on behalf of the seller. Coppersmith Antiques & Auction Co., agent for the seller, cannot guarantee the information to be correct or assume the liabilities for errors and omissions. All lines drawn on maps are approximate. Buyers should verify the information to their own satisfaction. Any announcements made from the auction block on day of auction will take precedence over any matter of print and will be final. HORSE ITEMS BITS & SPURS & ETC. JEWELRY LOT INCLUDES A 10KT GOLD EMBLEM & MISC.